What if Morehouse College had not been founded 150 years ago? What if Morehouse College had not been founded 150 years ago in Augusta, Georgia at Springfield Baptist Church? If there was no Morehouse for Dr. Sam Nabrit and Reverend Howard Thurman to become Morehouse Men in the 1920s, would the former have become the first black man appointed to the Atomic Energy Commission, or the latter later heralded by “Life” magazine as one of the greatest theologians of the 20th Century? If there was no Morehouse College for Phi Beta Kappa laureate Dr. Benjamin E. Mays to lead as president from 1940-67, would Fisk and Howard remain the only two prestigious HBCUs with a chapter of that prestigious honor society? Or, if there was no Morehouse for Dr. Mays to enhance the concept of the “Morehouse Mystique,” where else would academically gifted and socially awake black men receive almost daily training and reminders of their charge to advocate for the improvement of the race in every field of professional endeavor? If Dr. Mays had not mastered public relations in the 1940s, does a young Martin Luther King Jr follow his father’s footsteps and attend, or does he matriculate elsewhere? *Had a young King not attended Morehouse and been encouraged by President Mays when his active social life led to his gpa dipping considerably, does he later earn graduate degrees in theology and religion/philosophy in hopes of following in the footsteps of his mentor, thus setting him on his eventual path to lead the greatest non-violent social movement in 20th Century America? Or does King attend law school and live perhaps a more quiet but far more lucrative life, as he once considered? If there was no Morehouse for Ebony magazine Editor Emeritus Lerone Bennett Jr to attend and graduate the year after King (1949), what college does he attend and later consistently chronicle in the pages of those two iconic magazines that were staples in black homes, schools, churches and barber/beauty shops for decades, thus inspiring many precocious young boys to become Morehouse Men? If there was no Morehouse being praised in black communities across America during Jim Crow and in the rough transition years afterwards, would the careers of civil rights leaders Rev. C.K. Steele and Julian Bond, critically acclaimed filmmaker Spike Lee, Olympic gold medalist Edwin Moses, President George H.W. Bush’s Secretary of Health and Human Services Dr. Louis Sullivan, President Bill Clinton’s U.S. Surgeons General David Satcher and Henry Foster, President Barack Obama’s Secretary of Homeland Security Jeh Johnson, actors/entertainers Samuel L. Jackson, Bill Nunn and Saul Williams, and Nima Warfield, the first Rhodes Scholar from an HBCU (the first of four Morehouse Rhodes Scholars over the past 20 years, a number that is greater than most top 50 predominantly white colleges and universities), would these men—and thousands of other Morehouse Men who are teaching, preaching, building, litigating, healing, discovering, presiding, officiating and leading in a variety of disciplines, been the same? As a perennial top five HBCU, Morehouse College remains one of America’s storied treasures. But the anecdotal evidence suggests that the negative articles and publicity over the past few years is taking a toll on whether some parents are willing to send their sons to “Dear Old Morehouse.” Whether it is the false perception that the college is a bastion of homophobia and an inculcator or misogyny towards young sisters on the campuses of Atlanta University sister schools Spelman College and Clark Atlanta University, or whether it is the current hot topics focusing on the tension between outgoing President John Wilson, the Morehouse Board of Trustees and a faculty where many have lost confidence in said Board, these negative headlines are steadily chipping away at a brand that for 150 years, has produced GIANTS in world history. Far too many parents read the negative articles about Morehouse and conclude that they are not willing to pay 50-60k per year to send their sons to Morehouse. This disturbs me greatly because open embracing of homosexuality and attendant homophobia, misogyny and angst between faculty, administration and trustee boards happen at Harvard, Yale, Stanford and Georgetown as well, but the mainstream media often spend far more time praising those institutions histories and present day accomplishments as opposed to placing such angst on blast 24/7. 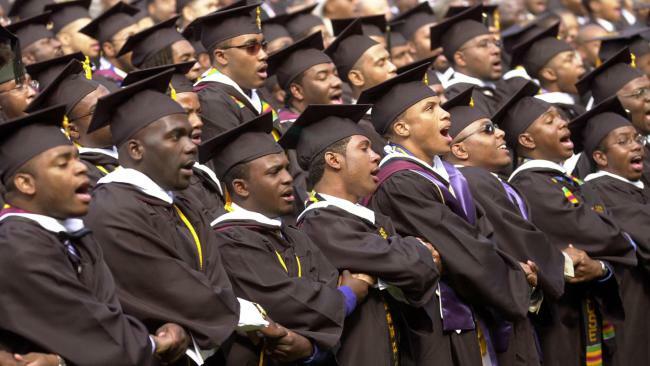 And yet, knowing that such angst exists, some black parents are more willing to spend 100k or more per year to send their black sons to PWI undergraduate schools whose black graduates do not hold a candle to the Who’s Who of black graduates from Morehouse and many other elite black colleges and universities. That some of these parents are HBCU grads makes the irony, indeed, rich.